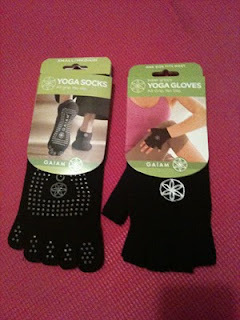 Not only did I try out the Gaiam No Slip Yoga Socks and Super Grippy Yoga Gloves, but I also gave both of these yoga accessories to my sister who is also big into Yoga herself. The "innovation" behind these are the sticky grip socks and gloves are that it makes yoga without a mat possible. The socks even have separated toes, like those multi-colored socks your friend got for you in middle school. This feature is supposed to allow more control. The gloves are fingerless. This again, allows control over your poses but also keeps fingers free and cool. I was really excited when I found them online and thought it would be SO COOL to try. It made logical sense that they would be helpful during my yoga practice, but unfortunately I WAS WRONG! I was in downward dog and my socks started to pull uncomfortably and in other poses just fall off of my feet altogether! =( The gloves weren't that bad, but I finally realized that I would much rather practice with the least amount of accessories necessary! It also just feels more natural with just your body and mat! This is a product that I wouldn't really say was useful and it also isn't super aesthetically appealing either. Oh and SORRY to my sister, Karen-- I owe you a new present!